I love fantasy sports and you love fantasy sports. I know, everyone knows it. Professional sports leagues know it, too, and they’ve tried to take advantage of the craze with changes to their All-Star games recently. The NHL implemented a fantasy draft for their All-Star Game in 2011, before introducing a new format in 2016. The NFL followed suit with their widely-disliked Pro Bowl in 2013, before returning to the usual conference format in 2016.And here comes the NBA, which has gradually turned viewers against its own midseason classic over the years due to disinterested play from its stars. The league announced Tuesday that they would ditch the Eastern Conference vs. Western Conference idea for a fantasy draft in which team captains will be determined by who receives the most votes in their respective conferences. 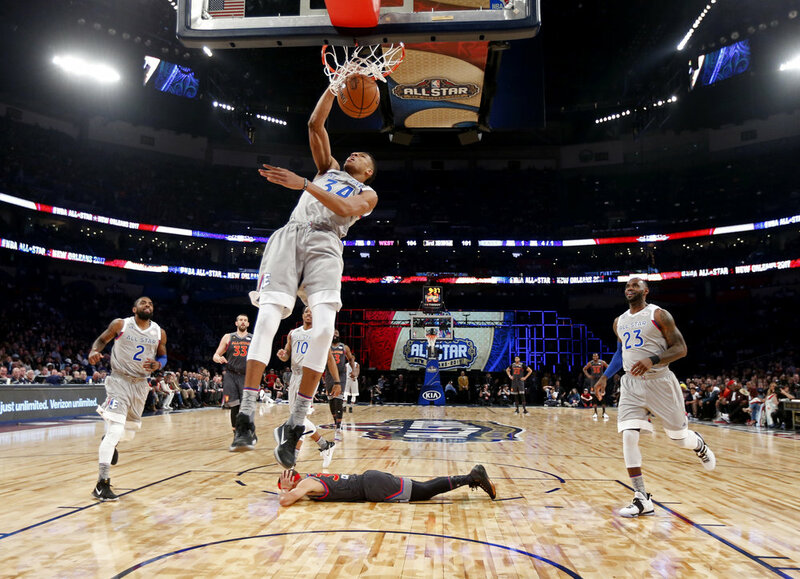 As the last remaining defender of the NBA All-Star Game, I am here for you, Adam Silver. I enjoy watching the world’s best basketball players throw down alley-oops from each other for three hours, and choose not to complain about it on Twitter. I like the NBA All-Star Game, and it just got even better. After another platoon of top talent was shipped westward this offseason, the imbalance between the NBA’s two conferences has grown even wider. Paul George, Paul Millsap, Carmelo Anthony and Jimmy Butler have switched sides, while only Gordon Hayward has come east to help make up for the gap. Stars like Karl-Anthony Towns will legitimately fight for All-Star spots in the West, while guys like Hassan Whiteside will easily slip onto the end of the bench in the East. The star power has tipped entirely in one direction. So, it’s the perfect year to mix things up and disperse players into one large group. Alliances will form once captains have been selected, leading to speculation about the exact kind of fake drama that gets Internet NBA fans so riled up. We’re going to get a lot of content out of this fantasy draft. The decision to make active players captains goes a long way, rather than handing the keys to former players. But back to the actual game. For years, it has been the object of scorn from NBA fans that want the players to pretend that they give a damn, rather than scooting around at half-speed, refusing to contest shots. All offense, no defense. That apparently doesn’t work for the same fans that obsess over big dunks and 3-point firepower. The days of competitive All-Star games are over. The weekend is a bonafide vacation, packed with parties for those who matter and those who don’t. By the time Sunday night comes, the guys are tuckered out and preparing to rest for the second half of the season. They don’t want to give 100 percent and potentially risk injury in a game that means literally nothing. Lucky for us, the All-Stars are still willing to put on a show. They toss lobs and throw down hammers with force. Steph Curry will pop long 3-pointers. Westbrook will still attempt to score as many points as possible. All of this is very fun, but it was getting stale. By implementing the fantasy draft format, the game will receive a minor shake-up that should keep things interesting without putting, say, home court in the NBA Finals on the line. That would be foolish. However, there is something at stake. Per NBA.com, “each team will select a Los Angeles-area charity or national organization where donations will be used to support local efforts.” That’s enough of a push to motivate players to compete for brownie points, as well as a nice move by the league to help people in need. Credit to NBPA President Chris Paul. The NBA is listening to some of your complaints. They know you don’t like the All-Star Game. With this change, they’ve kept the game’s spirit but tossed in some seasoning. It’s a success and I can’t wait to see if Team Banana Boat finally gets this show on the road, even if it’s at half-speed. Tyler Keating is the sports editor for The Daily Campus. He can be reached via email at tyler.keating@uconn.edu. He tweets @tylerskeating.